I went on a culinary adventure around the world this year without leaving my kitchen. Flavors from Greece, Thailand, Vietnam, the Middle East, Mexico and beyond tickled my palate. Along the way, I learned new techniques (easy pickled vegetables), added my own touches to recipes and experimented with substitutions. The results were lip-smacking delicious. These are the top recipes I tried for the first time in 2017. Bookmark this page for a globally inspired kitchen in 2018, and don’t forget to check out my favorite recipes from previous years here and here. Remember those pickled veggies I mentioned? They make an appearance here (and also in the Vietnamese lettuce wraps below). 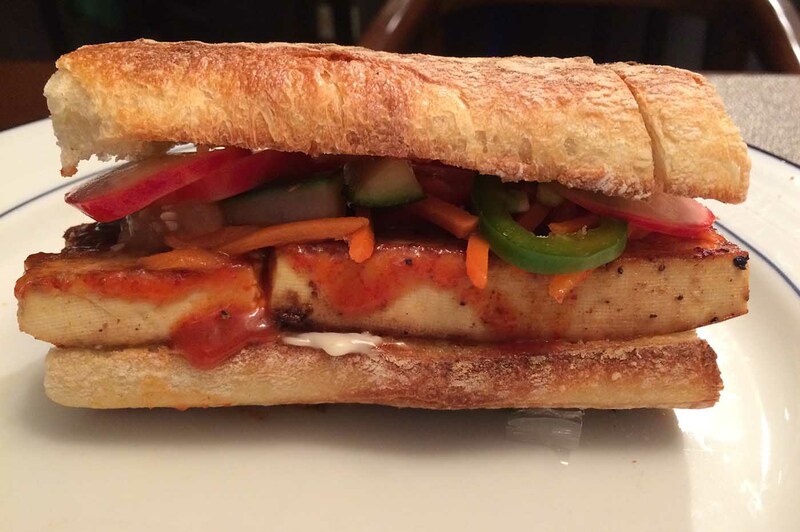 Make sure to use a crusty baguette for this sandwich and slather on the mayo and Sriracha to pump up the flavor. Be patient with the tofu; there’s a fine line between burnt and browned! Crunchy romaine, juicy tomatoes and creamy feta made this easy-to-assemble pita pocket an instant favorite. I added pitted Kalamata olives for flavor and chickpeas for protein. These hearty vegetarian bowls combine quinoa, green onion, chickpeas, broccolini and carrots in a scrumptious sweet and spicy sauce topped with peanuts. Fit Foodie Finds recommends dousing the bowl in Green Goddess dressing, but I skipped that step since the sauce was already doing its thing. 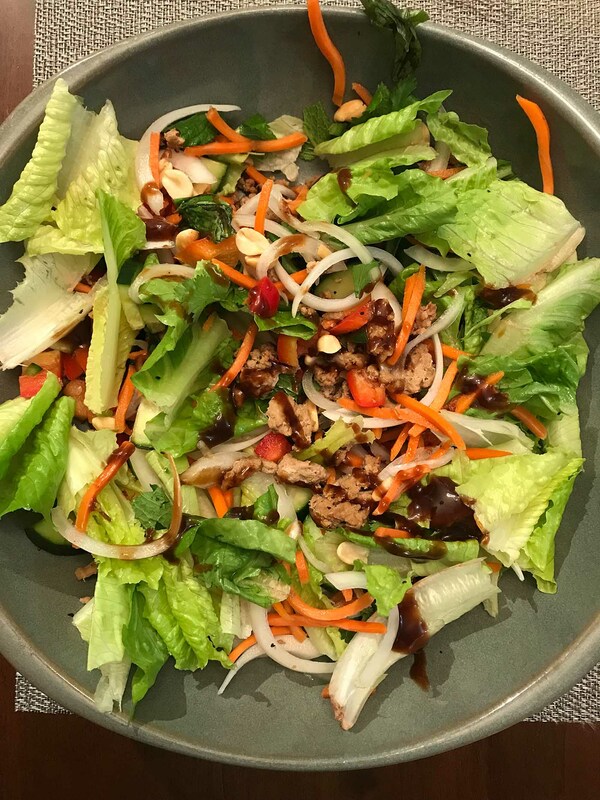 After devouring the black pepper pork lettuce wraps from Proxi, my husband and I were determined to find a copycat recipe to make at home. Thankfully, we found this decent substitution. Speaking of substitutions, we used ground turkey instead of pork and ground ginger instead of gingerroot. Additionally, we omitted the sweet rice wine and fish sauce because we couldn’t find any at the store. Guess what? No harm done. Lastly, we struggled to cram everything into the lettuce wrap exterior, so we ripped up the lettuce and turned the whole mess into a big ole salad instead. For dressing, drizzle the salad with Sriracha, hoisin sauce and a squeeze of lime. Whip up a fajita feast with this super simple recipe. Spice-rubbed shrimp, onions and peppers hit the oven for 10 minutes before heading to your mouth in a warmed tortilla. Add guacamole and sour cream if desired. Keep this recipe in your back pocket for cold winter nights. Sautéed sesame kale, brown rice and crispy chili garlic tofu show off their finest attributes in this easy dish. I never ate egg salad growing up, but for some reason, I still think of it as comfort food. Since grocery-store egg salad gives me the heebie jeebies, I prefer to make it at home. Once you’ve solidified your hard-boiled egg technique, you’re good to go. This version calls for Greek yogurt instead of mayo and also fancies things up with cornichons and capers. I know how easy it is to order pad thai for delivery, but it’s also surprisingly simple to make yourself. This recipe rivals any pad thai from GrubHub or Seamless, in my opinion. Plus, if you use the entire box of noodles, you’ll have leftovers for days. These are my alterations: 14 ounces of stir-fry rice noodles, four eggs, a package of firm tofu (chopped) instead of chicken, an entire bottle of pad thai sauce (I like House of Tsang Bangkok Peanut Sauce), lots of chopped green onions, shredded carrots, broccoli and no bean sprouts (not my thing). Increase the amount of vegetable oil slightly, and don’t forget to top with peanuts and a squirt of lime. My mother-in-law shared this recipe with me, and I was an immediate fan. Of course, I made some modifications to suit my personal preferences: I switched out ground pork for ground turkey, added a chopped green pepper and omitted the carrots. I also doubled the recipe so I could use the entire container of meat and most of the rice noodles. Serve this marinated chicken over brown rice with chopped cucumbers and tomatoes, pitted Kalamata olives, tahini sauce and hummus. You might want a pita on hand as well to scoop up all this goodness!